Julie is relaxed and fun; exactly the qualities required in a photographer on your wedding day. Not only was she able to capture our most precious moments, she ensured that we had fun and enjoyed each moment while she worked her magic. The images we got of our guests at the photo booth were fantastic and, while the guests were dressed up, the photos really captured who they are to us. We are both so pleased with our choice of photographer and we will very happily recommend Julie’s services to anybody seeking a photographer for any occasion. Thank you for capturing all of our special memorable and everlasting moments over our two wedding days! Your creative eye, friendly and fun approach left us with awesome photos to last a lifetime. Thank you for keeping our secret about the surprise wedding and for these memories. Julie is so easy and fun to work with. She has a great sense of humour which made us comfortable in front of the camera, something we have never been before. Thank you so much for being our photographer. We absolutely love the the pictures. You were able to capture all of the key moments and the details. We have had so many nice comments on the photos and I carry the photo book everywhere. You captured us and our emotions in ways I thought were impossible. We look forward to you capturing our next milestones. I was visiting my parents this past weekend and assisted my mom in getting a copy of the portraits printed from the CD you gave them. I want to tell you that they are so lovely! You really captured their relationship. I love the candid ones in particular, where they seem to take so much pleasure in one another - still after all these years (I sense you know which ones I am talking about, because they are often the ones you also produced in black and white, close up and other versions). Thank you for the beautiful portraits; your insightful eye; your generosity; for reminding me how wonderful my parents are. We didn't have the most conventional wedding and we wanted our photos to reflect this. 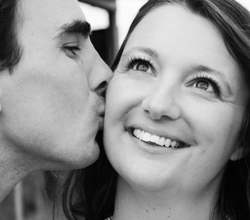 Julie was flexible from the beginning and listened carefully to our plans in the months leading up to the wedding. She immediately understood the atmosphere we were trying to create and provided many helpful suggestions about the kinds of photos that might best capture it. On the day of, Julie's laid back approach helped to keep us relaxed and she felt more like a guest than the photographer. Two of our closest friends are now using Julie for their own wedding after seeing how well our photos turned out, and we would strongly recommend her to anyone who was looking to hire a wedding photographer. Julie Gagne is an amazing photographer. She spent time getting to know us and making us feel comfortable so that the photos she took of us truly capture who we are. From the first phone call she was professional and helpful, and really worked with us to help us stay within our budget and get all the shots that we wanted from engagement photos to our wedding day. One of the people you spend the most time with on your wedding day is your photographer and Julie was incredibly calming to have by my side on my wedding day. She kept us on schedule and was very relaxed and fun to hang out with all day. She was able to capture our wedding day and I am so happy to have all of our memories preserved in such beautiful photographs. I highly recommend Gagne Photography! Julie is a very dedicated and artistic person. Julie strives for excellence and it shows in her work as a photographer. She has a keen eye for detail and also has a unique sense of humour which makes her clients feel comfortable and at ease. Julie always maintains a very professional attitude and image and I would highly recommend her as a photographer. We were extremely impressed by our interactions with Julie. She met with us several times prior to the wedding in order to be certain she was giving us exactly what we were looking for. She was professional, engaged with our guests, and managed to get all the important shots without being intrusive in any way. She arrived early, stayed later than our verbal contract stipulated, and returned our photographs long before the agreed-upon date. 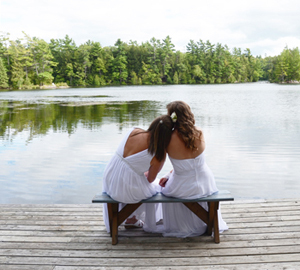 It goes without saying that Julie is talented at working with "difficult" people, as she met with this frazzled bride, my mother, and my sister (the maid of honour) and managed to keep her humor and dignity intact - we were not the easiest group to work with, I can assure you! Her photography was unique in that she took many artistic, unusual photos of my wedding party, and worked with them to ensure they were unlike any others, as my husband requested. However, she also captured the more traditional moments that were important to me, thus demonstrating her versatility and ability to deliver wedding photography that satisfies more than one taste. When she brought over our photographs, she took care to explain her decisions in regards to the composition and editing of the photos, which I appreciated. I would highly recommend Julie Gagne as a professional, dedicated photographer with original ideas that translate into photography that is both artistic and traditional, as the moment requires. Julie did all of the photography for our wedding. She worked with us for the entire day, at multiple locations. She is competent, creative, flexible, and professional. Her photographs were stunning. She ensured that all of our guests were represented, and she captured the spirit of the event. One of Julie's best assets is that she has a sparkling wit; she made us laugh all day long, and made our guests feel comfortable and relaxed. 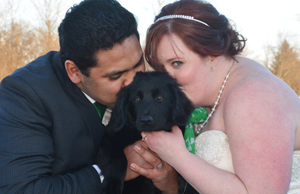 We went through all the photos today and they are so great. 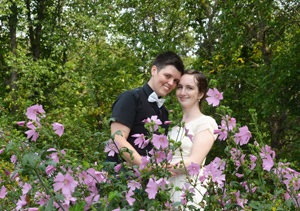 We are both really happy with them, and think that you did a spectacular job capturing our day. The hard part will be choosing which ones we want to enlarge. I can't thank you enough for doing our photos. You were so pleasant and fun to work with, and you took such care to capture the moments that were important to us. We were lucky to have found you. We came to Julie on referral by a friend and Julie exceeded our expections. Julie was extremely professional, and flexible and offered what we needed at an affordable price. Julie was on hand for the day and she went beyond what we expected. Julie was very friendly while shooting the photography making everybody feel comfortable and she took some amazing candid photos of family and friends we will treasure. Julie's photo books were absolutely amazing, and everybody always compliments us about them. Our wedding photos were amazing, we would definitely hire her for any future special moments in our lives. We truly appreciate the hard work she put in to our photos. Thanks so much for everything Julie.